Back pain affects eight out of 10 people and is one of the most common reasons people go to the doctor or miss work. Dr. Mark Knaub, an orthopedic surgeon at Penn State Health Milton S. Hershey Medical Center, talks about what you can do if you experience back pain and how to prevent it in the first place. Description – The video begins inside a lecture room at Penn State College of Medicine. In the background is a large screen that shows the Penn State Back Coach website (www.TheBackCoach.org) lab at, Penn State Health Milton S. Hershey Medical Center. Two people are standing next to each other looking at the camera. From left to right is Dr. Mark Knaub and Scott Gilbert. Scott Gilbert – From Penn State Health Milton S. Hershey Medical Center, this is Ask Us Anything about Back Pain. I’m Scott Gilbert. Well, back pain does affect at least 80% of all people at some point in their lifetimes. It can be a leading reason why people miss work and come in to see the doctor. The doctor talking with us today is Dr. Mark Knaub. He’s an orthopedic spine surgeon here at Penn State Health. We appreciate your time today. So tell us a bit about why back pain is so common in humans. Why isn’t it more preventable, it seems? Dr. Mark Knaub – Well, as you said 80-90% of people will have back pain at some point in their life. I think our spines are kind of designed to walk on all fours, but we walk upright. So it’s just a very flexible part of our skeleton. So it’s predisposed to injury. Scott Gilbert – Okay, and then so is that something that over time, as humans continue to evolve, may get better or maybe not? Dr. Mark Knaub – Maybe. Let’s hope. Scott Gilbert – Okay, you can’t make any promises, though, right? Dr. Mark Knaub – Absolutely not. Scott Gilbert – This is Ask Us Anything about Back Pain, and feel free to ask us anything in the comment section. Just place your question in the comment field of this Facebook post, whether you’re watching this video live or if you’re watching it on playback, and we’ll make sure we get an answer for you from Dr. Knaub. Let’s talk about some of the most common reasons for back pain. I understand that soft tissue injuries are one of the leading reasons. Can you give some examples of those? Dr. Mark Knaub – Probably the most common thing would be a muscular strain. So people lifting, performing activities where they’re twisting, certainly predisposes them to have some sort of a muscle injury. That would probably be the most common by far. Scott Gilbert – So lifting wrong. We hear always lift with your legs, not your back, that kind of thing? Dr. Mark Knaub – Yes, and we’re all very bad at it, including myself. Scott Gilbert – Including the doctor. Oh boy, that’s not very helpful, but what are some ways we can try to treat back pain ourselves at home. Are anti-inflammatory medications an option? Dr. Mark Knaub – So when somebody has an acute episode of back pain, the good news is that most people will get better, really not doing anything specific. But if people rest and take it easy for a couple of days, it doesn’t mean lay around and do nothing, but avoid lifting, bending, and things like that. They can use heat or ice. That tends to be helpful in the short-term. Nonsteroidal anti-inflammatories are a type of medication that can are a type of medication that can be used for it. But usually, after a couple days the symptoms will resolve on their own. Scott Gilbert – Okay, usually they do. Sometimes they don’t, though. Sometimes it becomes kind of a long-term thing. When should people start to think about seeking medical attention? At one point, I don’t know if there’s a set timeframe, but what are some indications that maybe it’s time to maybe go in to see the family doctor. Dr. Mark Knaub – So there are certain conditions, which make us a little bit worried. If somebody has a history of cancer, if they’ve had a recent bacterial infection; they have a history of previous fractures. In an older person, those would be things that you probably don’t really want to wait on. If your back pain lasts for more than a couple of days. If someone just has an episode of acute back pain, and it’s not better and say a week, ten days, two weeks, then that’s something you can go and visit your primary care doctor for. They can set you up with physical therapy, maybe give you some medications, and again, most people will get better. But you know, give it a week to ten days before you seek professional care. Scott Gilbert – And when you talk about cancer and infections, those could be a possible cause or the back pain can actually result from those? Dr. Mark Knaub – Yeah, so you could have cancer that spreads to your spine that could cause back pain. You could have an infection that spreads to your spine and causes an infection in your back. Scott Gilbert – You’re watching Ask Us Anything about Back Pain from Penn State Health. I’m Scott Gilbert. This is Dr. Mark Knaub. He’s an orthopedic spine surgeon here at Penn State Health Milton S. Hershey Medical Center. We welcome your questions and comments. Just leave them in the comment field below this Facebook post, and also, if you find this information helpful, as we hope you do, please feel free to share this post on your Facebook page. So we talked a bit about when it may be time to seek medical attention. I know disc injuries, such as herniations, you must see a lot of those in clinic, I’m guessing. Dr. Mark Knaub – Yeah, they’re pretty common in kind of the, we’ll call them, the middle age group, most commonly between the age of 30 and 50. Disc herniations are something that we frequently see. Scott Gilbert – And the disc is exactly what? What part of the back are the discs? Dr. Mark Knaub – So the discs are kind of the shock absorbers that sit between the bones of the spine. They help absorb forces, and they help control motion when we move. Scott Gilbert – But you say, as we age though do things tend to happen to discs? They can deteriorate over time? Dr. Mark Knaub – Yeah, so the reason that discs herniate is they start to wear out after our 20s, and they’re susceptible to herniation at that point. When you get to be much older, the discs are worn out to the point where herniation has become less common. Scott Gilbert – And we hear about various types of treatments for discs, for herniated discs, but what are some of the most common ways of dealing with it? Dr. Mark Knaub – So again, like an episode of back pain, a disc herniation has a favorable natural history. For most people they’re going to get better without specific intervention, but many of the same things that you do for back pain you would do for a disc herniation. Rest, heat and ice, anti-inflammatory medications. We’ll occasionally use oral prednisone or oral steroids. That could be helpful. If those things fail, physical therapy, epidural steroid injections can be useful in those situations, too. Scott Gilbert – You’re watching Ask Us Anything about Back Pain from Penn State Health. This is Dr. Mark Knaub, and we do welcome your questions here in the comment field on this Facebook post. So we talked a little about surgery. Obviously, you’re a surgeon. So I’m curious as to what some of the most common cases are that you see. I’m thinking of herniations, pinched nerves, disc injuries. Of those or other types of injuries, what do you see the most of? Dr. Mark Knaub – So the most common reason that we do spine surgery is for degenerative conditions or wear and tear. Disc herniations are included in that. So a disc herniation in someone’s low back may cause sciatica or radiating leg pain. That’s a very common surgery. That same process can happen in your neck, and you can get radiating arm pain. Again, that’s a pretty common operation. Older people can have spinal stenosis, which leads to leg symptoms. You can get a degenerative condition where you get pressure on your spinal cord, in your neck. Those are the most common things. At trauma centers and at an academic medical center, we may see infections and cancer and tumors, as well as trauma and fractures that lead to surgery, as well. Scott Gilbert – But surgery is not the first thing you go to, obviously. It’s one of many options on the table, some medication and some other treatments. You mentioned physical therapy also possibilities. Dr. Mark Knaub – Yeah, so for most back conditions, especially degenerative conditions, conservative treatment works most of the time, and that’s the thing that we go to first. Medications, physical therapy, we can even throw some non-traditional things like chiropractic and acupuncture in that are helpful for some people. Dr. Mark Knaub – So if the bone spurs are causing compression of the nerves, and that’s what’s giving you the symptoms that go into your legs, then many people can get better with conservative treatment, therapy, injections, medications. It doesn’t take the bone spurs away. But if someone feels better it doesn’t really matter that the bone spurs are there. If someone has symptoms that fail to respond to conservative treatment, we can surgically remove the bone spurs and take the pressure off the nerve. That’s likely to help with those types of symptoms. Scott Gilbert – Okay, Kim thanks a lot for your question. We were talking before we started this interview about some careers, and I found it interesting. Some of them I wouldn’t have imagined her at high risk for back injuries, but actually are. Can you tell us what some of those are? Dr. Mark Knaub – So anybody who does heavy manual labor or lifting, bending, twisting, is at risk. People who are subject to a lot of vibration. So a heavy machinery operator, a truck driver where they’re constantly being bounced in the cab of their truck, they’re also at risk for more back problems than someone who has a sedentary job. Scott Gilbert – Yeah, so it’s not just the lifting that can cause it. What is it about the vibration that that causes it? Dr. Mark Knaub – I don’t think we have a real great understanding of that. It probably has something to do with disc nutrition over time and the disc cells wearing out. That’s what we see with people that have degenerative discs. So maybe there’s something in the vibration that affects that. Scott Gilbert – So given that as we established earlier, humans are just not good at avoiding back pain, what are some habits people can try to implement or some best practices they can employ to do their best to be the 10 or 20% who don’t experience it? What are some tips you have for folks? Dr. Mark Knaub – So we know that people who use tobacco products in some form or another have higher risks of back problems. So avoiding those things. Obesity plays a role in back problems. The larger you are, the more likely your back pain. People who engage in some cardiovascular activity, even if it’s something as simple as walking your dog three or four times a week, those people are less likely to have back problems. So don’t smoke. Stay active. Don’t gain weight. You should — you have less risk. Scott Gilbert – One of the hashtags or sayings you see online sometimes is “Sitting is the new smoking.” Standing desks are all the rage. Is sitting a problem for extended periods of time, or is it the fact that sometimes we have bad posture and we’re bad at sitting? Dr. Mark Knaub – The position in which the pressure in your discs in your low back are the highest happens to be sitting. Now there’s no definitive studies that say people who sit have more back problems than people who stand, but people who have back problems often find that being in a standing position is more comfortable than being in a seated position. Scott Gilbert – You’re watching Ask Us Anything About Back Pain from Penn State Health. Dr. Mark Knaub is an orthopedic spine surgeon here at the Milton S. Hershey Medical Center, and he welcomes your questions, whether you’re watching this interview live, or if you’re watching on playback. Just add them to the comment field below this Facebook post. I want to talk a bit about the psychological component, the link between pain and depression. I mean, there’s a very tangible link there, right? Dr. Mark Knaub – Absolutely. We don’t know what comes first. In some cases, it may be depression causes an abnormal response to pain. Certainly, people who have chronic pain, it affects them mentally. We know that if you have someone that has chronic back pain and they’re depressed, their outcomes of treatment, regardless of what it is, are not as good. So as part of treatment in someone who has chronic back pain and depression, you have to treat their back pain and treat their depression to get the best outcome. Scott Gilbert – It’s more of a holistic approach, perhaps, working with a psychiatrist or something like that. Dr. Mark Knaub – Psychiatrist, psychologists certainly can be helpful. Scott Gilbert – Now in an earlier Facebook discussion on our page, Pat had asked a question about spinal stenosis, and I think that’s a that’s a condition a lot of folks would like to know but more about. Can you talk a bit about what it is and what causes that? Dr. Mark Knaub – So spinal stenosis describes narrowing of the spinal canal. It can happen anywhere along the spine, but it’s most common in the low back or the lumbar spine. With the narrowing of the spinal canal that comes from generally age-related changes, it affects how the nerves function. People with spinal stenosis will typically have symptoms in their legs. It can be one leg. Often, it’s both legs. They describe a sense of fatigue or weakness as they walk. Gets better when they sit down, when they push a shopping cart. Those are the types of symptoms that we see. Often, people have back pain associated with that, as well. Scott Gilbert – As we begin to wrap things up, if people are thinking, yeah, you know, I have this back pain. It’s kind of nagging, maybe chronic. I don’t know. I want to learn more. The next stop should be where? Perhaps their family physician? Dr. Mark Knaub – Family physicians are always a good place to start. They can go through the conservative treatments that they’re comfortable with. If someone has a condition where their primary care physician is not comfortable, they can always refer them on to the specialists. We’ve got plenty of people here that take care of people with back problems, including surgeons, physical therapists, physiatrists, pain management physicians. We really cover a broad range of medical professionals who can care for people with back problems. Scott Gilbert – And we’ll also put a link to the Spine Center website in the comment field below this Facebook post. Also want to encourage you to check out thebackcoach.org. thebackcoach.org is a free online assessment tool and so much more. There’s a lot of content on that website about many different types of issues around back pain and back injuries, including tips on how to perform yard work in the right way, and how to find the right mattress, and how to lift up your children. I know I’ve aggravated my back a few times lifting my kids, and so a lot of things we may not even think about. Some great information on thebackcoach.org, including a couple articles from this guy. You might want to check that out. So that, I think, about wraps it up. Anything else you’d add that we haven’t touched on today? Dr. Mark Knaub – Not really. 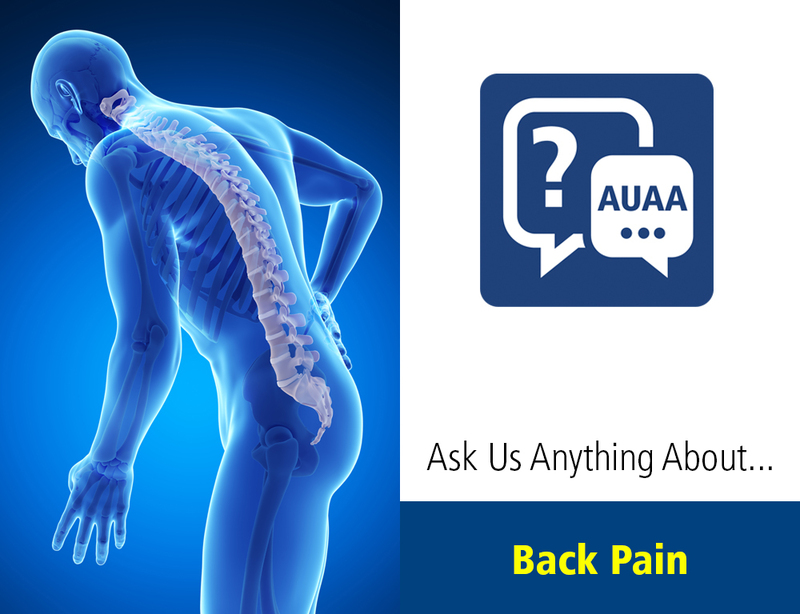 Just if you’ve got some chronic back issues, if you’ve got, you know, unanswered questions, you can reach out to us on the internet or come in and see us. Like I said, we’ve got plenty of people here that can take care of you and try to make you more functional and make your back pain better. Scott Gilbert – All right, Dr. Mark Knaub, thank you very much, and we appreciate you watching Ask Us Anything about Back Pain from Penn State Health.